Mountains, beautiful freshwater rivers, massive lakes, lush green forests; and some of the best wildlife in North America: does Idaho come to mind? It should! Here at Red Horse we know how lucky we are to be located in the middle of this beautiful northwest landscape, and we want to share this with our readers. For those of us who are lucky enough to call Red Horse Mountain Ranch home, or for those fortunate guests who have shared time here with us, we know what an amazing place this is, and it wouldn’t be the same if we weren’t located here in the Idaho Pandhandle. It is always so enjoyable to see the awe on our guest’s faces when they arrive here at the ranch, and this expression is seen from their first day, to their last day with us. Many times our guests have commented that when they imagined Idaho, they certainly underestimated its’ beauty. If you have the chance to visit us here at Red Horse and are planning on making a road trip of your vacation, see below for some great travel ideas to make the most out of your journey to Red Horse Mountain! #1: Lake Coeur d’ Alene: 49.81 square miles of beautiful blue water surrounded by green mountains, Lake CDA supports endless activities and wildlife viewing. Boating, jetskiing, swimming, kayaking, canoeing, scenic hikes, and some of the best fishing in the region; these are just a few of the attractions on Lake Coeur d’Alene. While many of these activities are also offered through our all-inclusive ranch vacations, if you have a few extra days its a great place to spend some time! #2: Lake Pend Oreille, Farragut State Park: Spend an entire day or a few hours at Farragut State Park, on the shores of the 5th deepest lake in the United States! Farragut State Park is just 18 miles from I-90, and it is a great place to take the kids for a swim or a hike on your way to Red Horse Mountain. Kayaking is also popular on Lake Pend Oreille, as this is a great way to take in the breathtaking scenery while getting a bit of exercise! 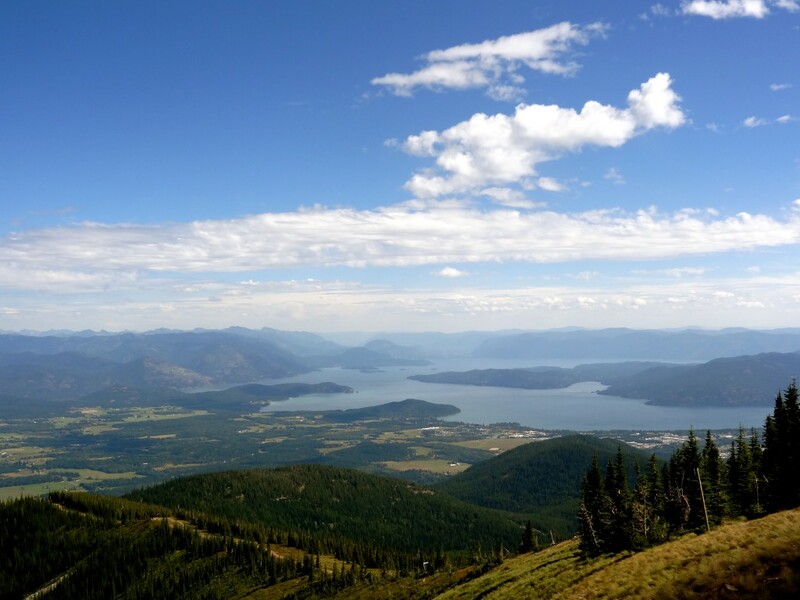 #3: Sand Point, ID: Check out this picturesque ski resort town, eat at a great restaurant on the shores of Lake Pend Oreille, or do a little shopping with your extra travel time. Sandpoint sits just a couple of hours north of Red Horse Mountain and just an hour north of Coeur d’Alene. #4: Schweitzer Mountain Resort: Although this is a top rated resort for winter skiing and snowboarding, it is also a great place to visit in the summer. The Schweitzer Village is a great place to stop for a bite to eat or shop, but you can also take the ski lift to the top of the mountain and go for a short hike or simply enjoy the amazing view! #5 Glacier National Park: If you are travelling by car from the Midwest or eastern United States, Glacier National Park is just over 5 hours to the northeast of Red Horse Mountain Ranch. Experience one of the most beautiful parks in the U.S.; you may even get to see bears, mountain goats, moose, and a number of other magnificent animals that make their home in the region. If you are allowed the extra travel time on your vacation, this is definitely worth the drive! #6 Leavenworth, WA: Driving to Red Horse Mountain Ranch from Seattle? Stop at this quaint Bavarian style town at the base of the Cascades. There are a number of activities to choose from: Shopping, fine dining, wine tasting, summer festivals, and almost any outdoor adventure you can think of from hiking to river rafting! #7 Silver Valley, ID: Silver Valley is composed of about a 40 mile span along I-90, and if you are traveling this route there are a bunch of worthwhile stops to fill a few hours of your travel time! Check out an underground mine tour or one of the many interesting museums; as well Silver Mountain Resort, which offers a number of outdoor activities, shopping, and dining. Whether you have a few hours or an extra day or two on your way to Red Horse Mountain, Silver Valley offers several historically worthy destinations with the spirit of the West! #8: Columbia River Valley Gorge: Another great route to Red Horse if you are heading here from Oregon, California, or even the Seattle area. The Columbia River Gorge National Scenic area is a hot-spot for salmon fishing, and has been inhabited for nearly 13,000 years. Carving its way through the beautiful Cascades, this route comprises amazing mountain scenery, from temperate rainforest to grassland; as well as the abundant wildlife of the Pacific Northwest. If you are looking for a longer, more scenic route on your way east to Red Horse, you wont be disappointed with the Columbia River Valley. #9 Yellowstone National Park: Established in 1872 and perhaps the most famous of national parks, Yellowstone exhibits the beautiful wilderness and geology of the northwest. Mainly located in Wyoming, but also extending into Montana and Idaho, this is a great and popular detour for those Red Horse guests making the road trip out to the ranch from almost anywhere in eastern half of the United States. Thanks for checking out the Ranch News, and hopefully this was another helpful post for those opting to make the most of their trip to Red Horse Mountain!